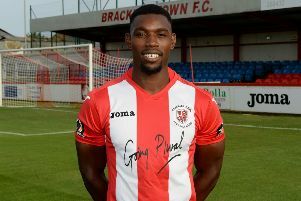 Brackley Town manager Kevin Wilkin had one eye on next season before the curtain came down on the current Vanarama National League North campaign. Cheer leaders, a brass band and supporters wearing Hawaiian shirts had Saints in carnival mood and the team responded with a final day 5-2 victory against already relegated Stalybridge Celtic, extending their unbeaten run to nine games. As other results came through it became clear that Saints had leap-frogged above Stockport County to finish the season in seventh, just one point outside the play-off places. Wilkin said: “I have been busy securing some of our current players for next season and there will be further announcements soon. We want to challenge at the sharp end if we can and we have a lot we can build on. James Armson took his tally to 25 with a brace, while Lee Ndlovu and David Moyo and also scored. Substitute Rio Ahmandi and Gary Gee, with a late penalty, replied for Celtic before substitute Steve Diggin rounded it off. Looking back on Saturday’s performance, Wilkin added: “We played well, it was about showing good attitude. We were comfortable and it has been a good finish to our season.